Answer: Yes. It is called the steeple cast. 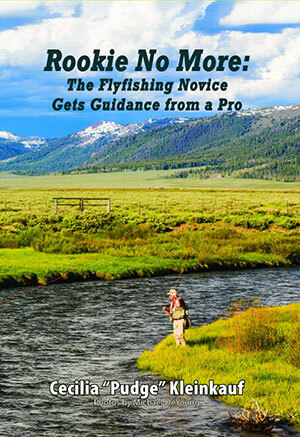 The steeple cast is a cast that you’ll find yourself using quite a lot, especially if you fish from a drift boat or in an area with thick vegetation or other obstructions behind you. Think of the steeple cast as one that goes up and then slants down and out to reach the two casting stops rather than going back and forth between them. Many people are taught to cast using the clock analogy with the basic overhead cast going from eleven o’clock to one o’clock in a straight line. Instead of propelling the rod back to eleven o’clock, however, the steeple cast propels it up to a twelve o’clock stop to help it clear the hindrance behind you before slanting down to the one o’clock stop toward where you want the fly to land. Don’t try to make your casts too long as the breeze is more likely to catch this cast than a regular cast. Also, because your arm will tire quickly, don’t make too many false casts. As with many of the other casts, I recommend that you get out your phone or video recorder and video yourself while practicing this and other casts so that you can see the differences between them.